Jeans are considered as a all time good to go attire. Jeans are not only easy to carry but also it is easy to style with them. The best thing about jeans is that they always remain in fashion in-spite of constant changing trends in the fashion. Jeans comes with so many variations like skinny, cropped, ripped, loose bottom and many others. With these enormous variation the confusion still remains that how to make jeans look more stylish. We have spotted many bollywood celebrities who play on the field of denims and leave space to give inspiration to their followers as well. The classiest combination of blue and white never go out of style. Combine this blue-white combo with some statement accessories like Deepika Padukone and look charged. The double denim relatively works slowly on the trend. 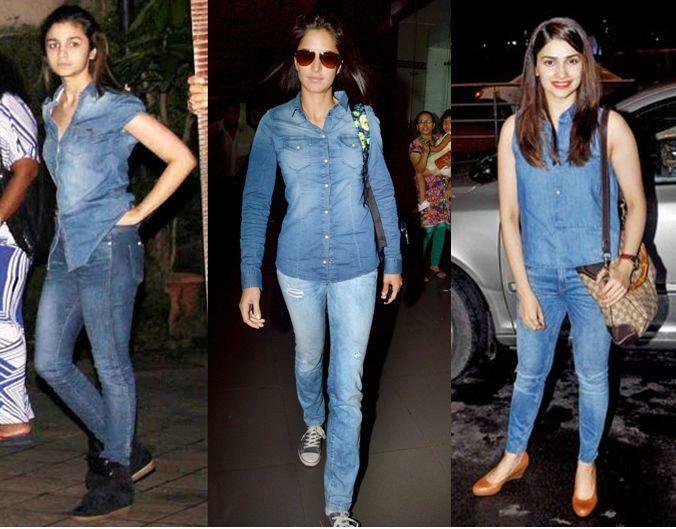 But still Prachi Desai and Katrina Kaif rock with double denim. For the colourful chicks crop tops look awesome giving a tangy looks on denim. Get them right with our gorgeous ladies in town like Esha Gupta and Priyanka Chopra. Lately graphic tees are most in fashion and our celebrities like Kareena Kapoor and Sonakshi Sinha flaunting their thoughts around with the graphic tees with denims and look ready to debate. Always a topic of confusion how to wear denim with layers... Take lessons from Shilpa Shetty and Anushkha sharma to how to layer the denims and look stylish with so much ease. Take out your fashion diaries and note how to wear a printed jacket from Shilpa Shetty and Kareena Kapoor. Don’t you want to try this now? White coat is a must for the wardrobe of ever girl. We can style with white in many ways. Our celebrities like Madhuri Dikshit and Chitrangada Singh have laid the field with the tips to wear white and get a stylish look like them. Black looks all hot when you pair it with denims. It looks more awesome when you wear it gracefully like Karishma Kapoor and Shraddha Kapoor. Which style of denim you are going around with?? ?